Fig. 9.1. 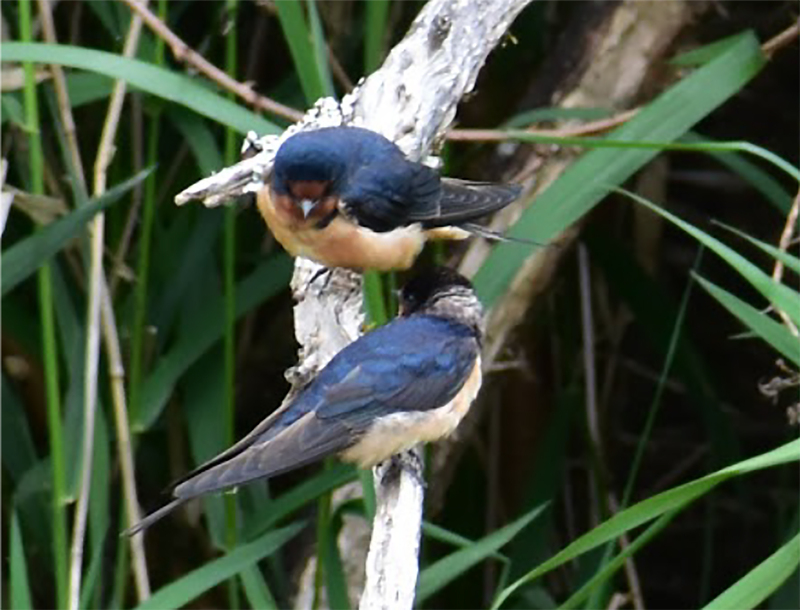 Two Barn Swallows. Photo by Daniel Patton, BLM Dean Creek Elk Viewing Area, May 22, 2018. Currently, birding in the Elliott is just used as a recreational activity and for hunting, however, there is little to no precise data on locations of bird nesting or hunting spots in the Elliott which make these activities difficult without luck on your side. 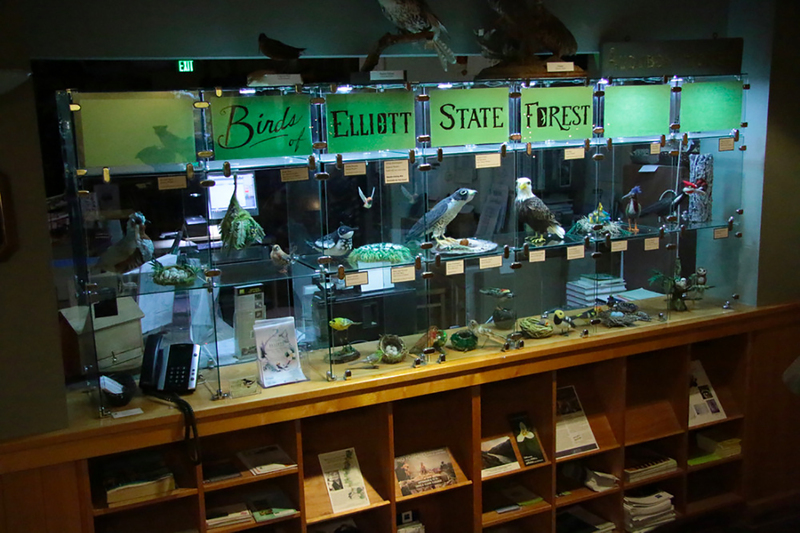 The Audubon Society of Portland held a two-month long “Birds of the Elliott State Forest” art exhibit in their facility in 2017 (Moulton 2017). The artist, Suzie Moulton, is a huge fan of the Elliott State Forest as hiking through it helped her through some personal tough times. Suzie sketched each bird she came across while hiking through the Elliott, and later created an assortment of different birds from textiles, which were showcased in the Audubon Society’s headquarters. She even created a game called Project Bird Baby Nest with the goal to entice people and children into learning more about birds native to the Elliott State Forest. “Birding is a major recreational industry,” stated Marty Giles (personal communication, May 22, 2018). Birding is an activity where one can watch, photograph, and/or record data of the various bird species. The Elliott State Forest and bordering lands are the home of some 103 different species of birds, give or take (Decker 2011: E-6-9). Fig. 9.2. Red-Winged Blackbird. Photo by Daniel Patton, BLM Dean Creek Elk Viewing Area, May 22, 2018. Map 9.1. 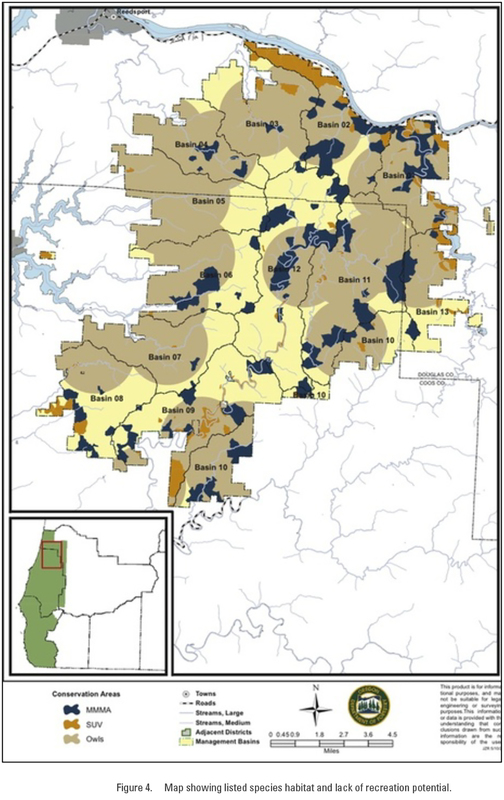 “Map showing listed species habitat and lack of recreation potential” (Sim et al 2014: 32). There is potential for School Trust Funds by selling maps of specific bird observation, nesting, and/or hunting locations (after research is done to find these locations) to those unwilling to adventure out and find them on their own. It would cost around $1.27 to create one map, which could then be sold between $3 and $10, depending on the rate of return, which would be a margin of $1.73 to $8.73 each map. Another possibility would be to sell postcards with pictures of the birds in the Elliott on them. Postcards are typically cheap to print, around $0.71 each, and can be sold for $5 a piece, giving a margin of at least $4.29 per postcard. (“Same Day Postcard Mailings”) Selling other birding merchandise and memorabilia (i.e. magnets, coffee cups, posters, etc.) could be another potential but the margin may not be as great. We would need a gift shop for these, or work something out with local businesses surrounding the Elliott to sell the items through them. Birding passes could be a possibility, but I would not suggest it because that might deter people instead of attract them. The “Oregon Birding Association” awards grants up to $750 for each project that promotes “education, enjoyment, conservation, and science of birds and birding in Oregon”. This could be a great opportunity for income to at least start a birding project for the Elliott. Fencing off key habitats and nesting zones for bird safety and livability with specifically marked zones for birding would be an option. Research is needed to locate prime nesting zones. Birding locations may interrupt other recreation activities. To prevent this, birding locations should remain separated from the other recreation locations while birds inhabit the areas. In Map 9.1, the circular tan zones are areas said to be protected due to spotted owl habitats. It appears as though only logging is not permitted. Table 9.1. Birds of the Elliott (Decker et al. 2011: E-6-9).